The ankle joint, which is very important for normal walking, is fortunately resistant to forming arthritis. If the ankle, however, has suffered injuries, advanced arthritis can set in over time. For patients with end-stage arthritis of the ankle (limitation of motion and/or worn out joint surfaces), there are relatively few treatment options outside of surgery. For patients with end-stage ankle arthritis, ankle joint replacement is a viable option. The era of ankle replacement began in the 1970's, when a doctor tried to replace the ankle with an upside down total hip replacement. Shortly thereafter, there were many attempts at developing a reliable total ankle replacement. Nearly all of the early total ankle replacements failed for various reasons, including poor methods for attaching the implant to bone, inaccurate placement, and poor matching to the normal joint mechanics. 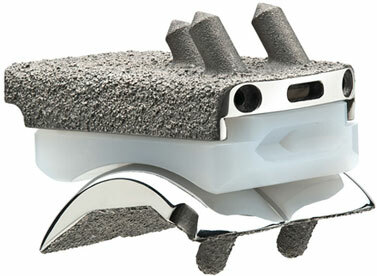 Second generation implants were developed in the late 1980's and early 1990's. 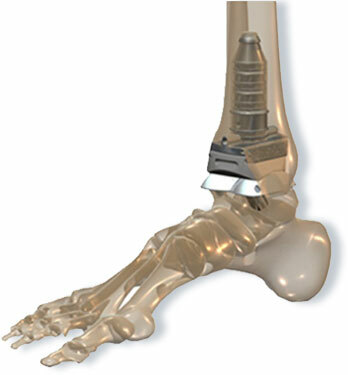 Over the past 20 years, the instrumentation has improved, the implant materials and engineering have been refined, and reconstructive ankle surgeons are now considering the procedure a true alternative to joint fusion in some patients. Today, the clinical outcomes of ankle replacement are better and are more predictable. In terms of function, ankle replacement is better than ankle fusion. This is because the ankle, when it is fused, limits up and down motion of the foot on the leg. In ankle replacement, however, motion at the ankle is preserved, allowing for improved function. The motion of the ankle implant also provides a protective function for the remaining joints in the foot, whereas a fused ankle can develop arthritis due to stress. Patients that have their ankle fused will nearly always develop arthritis in these adjacent foot joints within 7-10 years after fusion. Dr. Leon Reber is Board Certified in Foot and Ankle Reconstructive Surgery. Dr. Reber trained with some of the top Orthopedic and Podiatric ankle joint replacement surgeons, including Dr. Sigvard T. Hansen, Dr. Jack Schuberth, and Dr. Jeff Christensen. This unique training background, and a passion for ankle replacement surgery, has led to very successful outcomes for his patients. Dr. Reber is trained to use the INFINITY, INBONE, and STAR joint replacement systems.